Mama Mummy Mum: What's For Dinner Tonight?? Being a family of six, the shopping bill normally ends up far more expensive than I want it to be, we tend to stick to the same type of meals to keep the cost down, this means dinner times can become quite boring. So when I got the chance to review Schwartz new 2 in 1 range, I was more than happy to accept. There are 5 different varities of this new range and I didn't know which ones I would be getting. I received two different recipe mix sachets, Mediterranean Chicken Pasta and Cheesy Crumb topping and Garlic and Thyme Roast Chicken and Crispy Roast Potatoes. 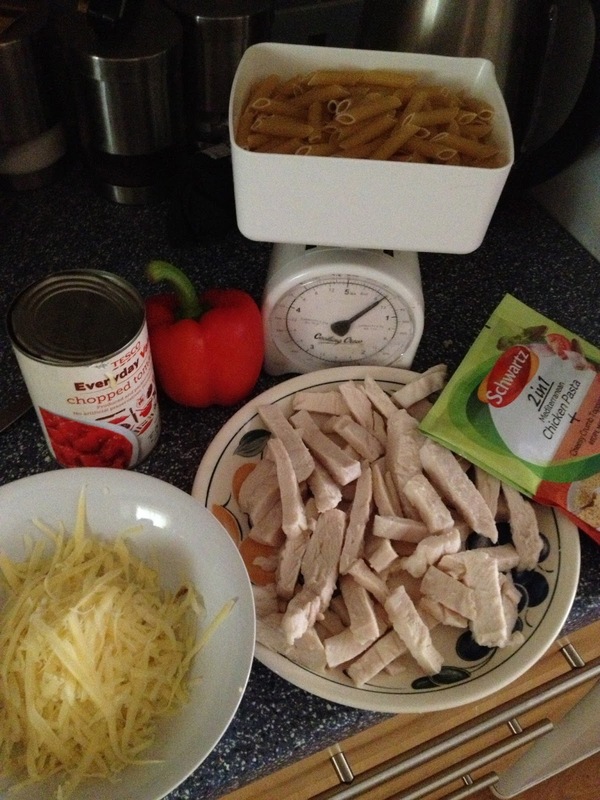 I chose to make the Mediterranean Chicken Pasta first, mainly because we always have pasta in the cupboard and is a firm favourite in our house. 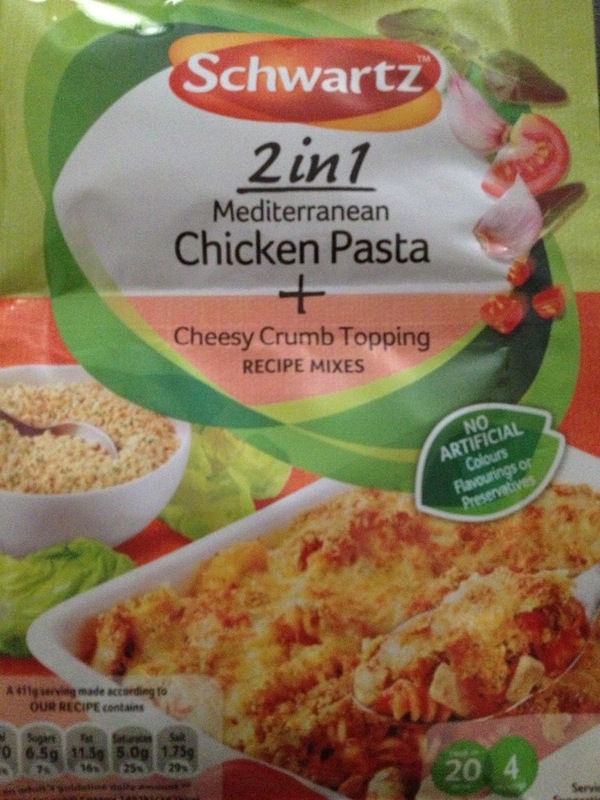 The idea of the 2 in 1 range is that you have one sachet that flavours the main dish and one sachet that either contains seasoning for a complementary side dish or a topping for the main dish. I love how it is two sachets in one, you open one up at the top of the packet and open the other up at the bottom of the packet. On the back of the packet it clearly states what ingredients will be needed to make the dish and there is a simple recipe to follow too, so even if you think you can't cook, I think you would struggle to go wrong with this!! I like that there aren't too many ingredients to buy, I must admit I cheated and bought frozen chicken strips as this was cheaper than buying the chicken breasts. Before I could begin cooking, I needed to prepare the food, this meant chopping up the pepper, cooking the pasta, mixing the chicken pasta mix with water and browning the chicken pieces. Once everything was prepared, the cooking of the dish was quick and straight forward, this would be an ideal meal if you don't have a lot of time on your hands. Simply add the diced pepper to the already cooked chicken, cook for 2 minutes then stir in the sauce and the chopped tomatoes, bring to the boil then simmer, add the pasta and heat through for another couple of minutes. Transfer the mixture to a baking dish and sprinkle with the cheesy crumb topping and then cover in the grated cheese. Place under the grill for 4-5 minutes until golden, what did I say, oh that's right, easy!! Once cooked, it was time to dish up, the children by this point were already sitting at the table, some would think I don't feed them enough!! I was really impressed with just how much food this recipe made!! It not only fed the whole family, we had left overs too. Everyone gave it a big thumbs up, plenty of flavours and textures and very filling. Looks tasty! Commenting for myself and on behalf of BritMums and thanking you for taking part.